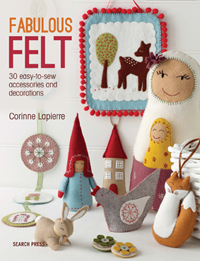 30 easy-to-make, stylish decorations all made from felt. he book includes templates, a comprehensive techniques section, guide to embroidery stitches and beautiful hand-drawn illustrations to accompany every project. The projects include mug hugs, hanging decorations, seasonal decorations, pillows, ornaments, wall-organisers, brooches, childrens toys and more.